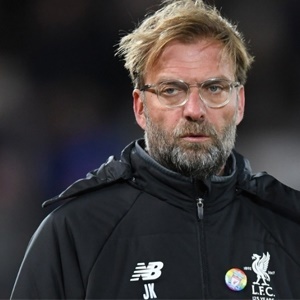 Brighton - Jurgen Klopp has insisted Liverpool's immediate target is to establish themselves in the top four of the Premier League before they start looking towards leaders Manchester City. Klopp's side confirmed their recent progress with a 5-1 win away to Brighton and Hove Albion on Saturday. It was Liverpool's fifth win in six league matches, with one draw, since their 4-1 defeat at Tottenham Hotspur. The Reds' success on the south coast left Liverpool in fourth place, a point ahead of Arsenal following the Gunners' 3-1 loss at home to Manchester United in Saturday's late kick-off. Liverpool's latest win typified the attacking strength that has delivered 25 goals in the last eight games in all competitions, a tally that has drawn comparisons with Pep Guardiola's free-scoring City side. "In our calmer moments we played good football," said Liverpool manager Klopp. "I don't know if you can compare us to Manchester City but we are a really good football team and we know that. "But we need to carry on, that's the most important thing," the German added. "It's important that it's good because we need the points, and we want to stay as close as possible to the teams in front of us. "We cannot get them immediately because they obviously win a lot of games as well, but we want to be as close as possible to them," said Klopp, whose side could end the weekend 14 points adrift of City if Guardiola's men beat West Ham on Sunday. "But the next game is coming, and all of them are really important for us," said the manager, with Liverpool facing Spartak Moscow in the Champions League on Wednesday before next weekend's Merseyside derby with Everton. Roberto Firmino, Philippe Coutinho and Mohamed Salah led Liverpool's attack with Sadio Mane, Daniel Sturridge and Dominic Solanke held in reserve on the bench. Firmino scored twice after Emre Can had put Liverpool ahead and Coutinho added the fourth after a Glenn Murray penalty had brought Brighton back into the game before the Brazilian's shot was turned into his own goal by Lewis Dunk. "The next game is coming, and all of the forwards are really important for us. It's cool to have these options," Klopp said. Coutinho's 87th minute free-kick effectively killed off the game, with the former Inter Milan player drilling a low shot under the defensive wall after the Brighton defenders jumped in anticipation of a chipped effort. Klopp revealed the goal was down to thorough work by Liverpool's s video analysis team. "I love goals like the free-kick. It was a credit to the analysts. They see something like this in the video meeting. But you have to have the ability to do this." For Brighton this was their first home defeat since they lost to Manchester City on the opening day of the season. But Brighton manager Chris Hughton said Liverpool were the most impressive side to visit the Amex Stadium so far this season. "Up with Man City, Liverpool are the best offensively in the division. They've got pace and that's the hardest thing to deal with. "We've been good so far and this was our toughest test. We've fallen short and they're now aware of what can happen. Occasionally, we are going to get days like this. Importantly, it's about how we bounce back." Hughton added: "We were too naive and we haven't been like that against anybody. We got served a lesson today and we need to learn from that."